We are poised at a major turning point in the history of information management via computers. Recent evolutions in computing, communications, and commerce are fundamentally reshaping the ways in which we humans interact with information, and generating enormous volumes of electronic data along the way. As a result of these forces, what will data management technologies, and their supporting software and system architectures, look like in ten years? It is difficult to say, but we can see the future taking shape now in a new generation of information access platforms that combine strategies and structures of two familiar – and previously quite distinct – technologies, search engines and databases, and in a new model for software applications, the Search-Based Application (SBA), which offers a pragmatic way to solve both well-known and emerging information management challenges as of now. Search engines are the world’s most familiar and widely deployed information access tool, used by hundreds of millions of people every day to locate information on theWeb, but few are aware they can now also be used to provide precise, multidimensional information access and analysis that is hard to distinguish from current database applications, yet endowed with the usability and massive scalability of Web search. 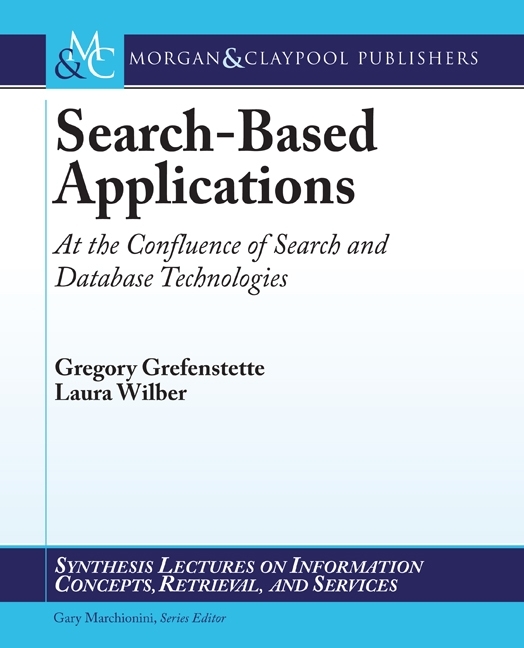 In this book, we hope to introduce Search Based Applications to a wider audience, using real case studies to show how this flexible technology can be used to intelligently aggregate large volumes of unstructured data (like Web pages) and structured data (like database content), and to make that data available in a highly contextual, quasi real-time manner to a wide base of users for a varied range of purposes.We also hope to shed light on the general convergences underway in search and database disciplines, convergences that make SBAs possible, and which serve as harbingers of information management paradigms and technologies to come.